An investigation continued Monday into the Saturday crash of a small plane typically based at the San Carlos Airport that went down near an airport in Madras, Oregon, killing a Menlo Park man. Investigators with the National Transportation Safety Board said Sunday the tail number of the aircraft is registered to Mark Rich, 58, of Menlo Park, and Jefferson County officials on Monday confirmed Rich was the person killed in the crash. An employee who works at the San Carlos Airport said the small plane took off from the Peninsula city earlier in the day Saturday. The employee added that the plane was usually housed at the San Carlos Airport. 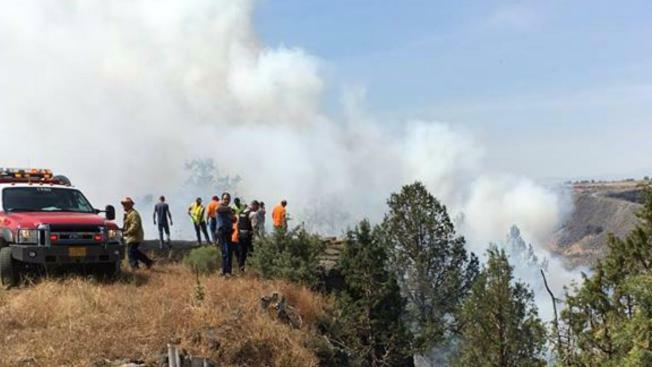 Officials in Oregon originally reported that two people died in the Saturday afternoon crash, but a futher investigation revealed that only one person was killed near the airport in the town where many people were gathering to view the solar eclipse. The homemade aircraft was completely destroyed and had been engulfed by fire. Jefferson County Sheriff Jim Adkins says a further investigation and statements obtained from family and friends indicated the pilot was alone at the time of the crash. "A reservation tied to the plane for two persons to stay in the local area originally suggested that the pilot and a passenger were on board," Adkins said in a statement. "After talking to a family member who had originally planned to make the trip, but changed plans, we can confirm there was just one person on the flight."